Estrogen signaling plays a critical role in a number of normal physiological processes and has important implications in the treatment of breast cancer. The p160 nuclear receptor coactivator, AIB1 (amplified in breast cancer 1), is frequently amplified and overexpressed in human breast cancer and has been shown to enhance estrogen-dependent transactivation. To better understand the molecular and physiological consequences of AIB1 overexpression in breast cancer cells, an AIB1 cDNA was transfected into the low AIB1 expressing, estrogen-receptor (ER) negative breast cancer cell line, MDA-MB-436. The features of a derivative cell line, designated 436.1, which expresses high levels of AIB1, are described and compared with the parental cell line. A significant increase in the levels of CREB binding protein (CBP) was observed in 436.1 cells and immunofluorescent staining revealed altered AIB1 and CBP staining patterns compared to the parental cells. Further, transient transfection assays demonstrated that the overall estrogen-dependent transactivation in 436.1 cells is approximately 20-fold higher than the parental cells and the estrogen dose-response curve is repositioned to the right. Finally, cDNA microarray analysis of approximately 7,100 cDNAs identified a number of differentially expressed genes in the 436.1 cells. These observations lend insight into downstream signaling pathways that are influenced by AIB1. Estrogen hormone action is an essential regulator of physiologic responses ranging from reproductive development and function to bone formation and fat metabolism. Estrogens have also been considered one of the major adverse factors in the pathogenesis of breast cancer, the second leading cause of cancer-related deaths in American women [1, 2]. Estrogen action is mediated through the estrogen receptors, ER-α and ER-β, members of the nuclear hormone receptor superfamily [3, 4]. Also critical to estrogen signaling are the interactions of ER-α with transcriptional coactivators including p/CAF, CREB binding protein (CBP), p300, and the p160 family members (reviewed in ). It isthought that the coactivators activate transcription through the modification of histonesand the bridging of sequence specific transcription factors, including nuclear receptors, to the pre-initiation complex. Moreover, transcriptional activation through ER-α depends upon an ordered assembly of coactivator proteins on and off the promoter of the targetgene in a cyclic fashion [6, 7]. This selective modulation of cofactor assembly potentially contributes to the tightly regulated pattern of tissue-specific estrogen response. The p160 coactivator, AIB1, was identified during a search for genes that are frequently amplified in human breast cancer . The frequent gene amplification and overexpression of AIB1 in ER-positive human breast cancers is hypothesized to confer a selective growth advantage through increased hormone signaling [8, 9]. While it is likely that overexpression of AIB1 contributes to tumorigenesis through this mechanism, overexpression of AIB1 has also been observed in breast tumors that are ER-negative, suggesting increased expression of AIB1 perturbs additional signaling pathways which may have important implications in the absence of ER . In the present study, low AIB1 expressing, ER-negative breast cancer cells, MDA-MB-436, were transfected with the human AIB1 cDNA and selected for stable expression of AIB1. One of the clones expresses high levels of AIB1 message and protein and is referred to as 436.1. These cells were used to investigate estrogen receptor activity in transient transfection assays and cDNA microarray analysis was performed to identify differentially expressed genes. Here, we report the characterization of the 436.1 cell line and suggest that it may be a useful tool for examining the effects of AIB1 overexpression on a variety of signaling pathways. The breast cancer cell line, MDA-MB-436, was obtained from the American Type Culture Collection (ATCC) and cultured in RPMI 1640 medium (Life Technologies) containing 10% fetal bovine serum. Stable transfections were performed using the standard calcium-phosphate technique using the CalPhos Maximizer System (Clontech) according to the manufacturer's recommended procedures. To generate stablytransfected lines, MDA-MB-436 cells were seeded at 1.5 × 105 cells per well into 6-well culture dishes (20 mm2) and grown overnight. Cells were transfected with 2.0 μg pcDNA3.1-AIB1 (described in ) or empty pcDNA3.1 vector (Invitrogen) and refed thefollowing day. After 48 hours, cells were transferred to 100 mm2 dishes and selected in culture medium supplemented with 500 μg/ml neomycin (G418) (Life Technologies). After approximately three weeks, neomycin-resistant colonies were isolated usingcloning rings and transferred to 12-well dishes for expansion. RNA was extracted from exponentially growing cells using the RNeasy kit (Qiagen). Following extraction, 10–15 μg of total RNA was electrophoresed in a 1.0 % formamide/formaldehyde agarose gel and transferred by standard methods . An RNA ladder, 0.24–9.5 kb (Life Technologies), was used as a molecular size marker. Hybridization was performed using a 32P-dCTP random-primed 2.2 kb Not/SacI fragment of pCMVSPORT-B11 as probe (described in ). For Western blot analyses, cells were harvested and lysed in RIPA buffer (1X PBS, 1% NP40, 0.5% sodium deoxycholate, 0.1% SDS) containing complete protease inhibitor cocktail (Boehringer Mannheim). Cellular lysates were collected after centrifugation at 10,000 × g for 15 minutes. Approximately 100 μg of total protein was denatured by boiling for three minutes in sample loading buffer (Novex) and separated by SDS-polyacrylamide gel electrophoresis. To examine proteins from transient transfection assays, a total of 3 × 10 μl of cell extract from each triplicate was pooled for Western analysis. Resolved proteins were transferred onto nylon membranes and blockedovernight at 4°C in 5% milk/PBS. AIB1 protein was detected by chemiluminescenceusing a mouse monoclonal antibody, AX15.2 . Estrogen receptor and CBP were detected using the anti-ER-α polyclonal antibody HC-20 and the anti-CBP antibody A-11 (Santa Cruz Biotechnology), respectively. Secondary antibodies used were HRP-goatanti-mouse IgG Fc specific and HRP goat anti-rabbit IgG (Jackson Immunoresearch) and detection was done using the ECL chemiluminescent substrate (Amersham) and exposing to autoradiography film (Hyperfilm-ECL, Amersham). For fluorescent microscopy, adherent cells were grown on Falcon culture slides (Becton Dickenson) to 70% confluency. Cells were fixed with 2% paraformaldehyde, permeabolized with 1:1 methanol/acetone and blocked with 5% normal goat serum/1% casein/0.5% BSA/0.2% Triton X-100. Cells were incubated with 1:5 dilution of anti-AIB1 mAb AAP.1 hybridoma culture supernatant  and anti-CBP for 1 hour at room temperature. After washing with PBS, the cells were incubated with 2 μg/ml Rhodamine-conjugated goat anti-mouse IgG and 2 μg/ml FITC-conjugated goat anti-rabbit IgG (Jackson Immunoresearch) for 1 hour at room temperature. Following a finalwash, DAPI mounting media and coverslips were added and slides were analyzed using a fluorescent microscope (Zeiss Axiophot). To examine the effects of estrogen, cells were transiently transfected using Lipofectamine transfection reagent (Life Technologies). The transfections were performed with 1.0 μg pGL3. luc.3ERE or pTK. luc. ERE reporter vectors, 0.4 or 10 ng of pHEGO-hyg (wild type estrogen receptor coding sequence plus hygromycin resistance, ATCC), and 5.0 ng ofpRL-tk (Renilla null luciferase reporter; Promega). The day following transfection, cells were incubated in the absence or presence of varying concentrations of 17β-estradiol or 100 nM 4-hydroxytamoxifen. Cell lysates were harvested 48 hours post transfection and reporter activities were determined using the Dual Luciferase Reporter Assay system (Promega) and the supplier's recommended methods. The pGL3. luc.3ERE, which contains three tandem copies of the ERE upstream the Simian Virus 40 promoter driving the luciferase gene, was the kind gift of Fern Merdoch (University of Wisconsin). The tk. ERE. luc, which contains three ERE upstream the thymidine kinase promoter, was giftfrom Susan Fuqua (Baylor University). The activity for subsaturating concentrations of 17β-estradiol was expressed as percent of maximal activity with saturating concentrations of 17β-estradiol (10 nM). In cases in which saturation was reached at concentrations below 10 nM 17β-estradiol, an average of the maximal activities was utilized to determine percent of maximal activity. The results are expressed in relative luciferaseactivity (Luciferase/Renilla.). cDNA microarray preparation and analyses were performed according to standard NHGRI protocol http://www.nhgri.nih.gov/DIR/Microarray/main.html. Microarrays consisted of 7,088 known human genes. Briefly, RNA was extracted from cells using TRIzol purification (Life Technologies) followed by purification with the RNeasy kit (Qiagen). Sixty to 80 μg total RNA was fluorescently labeled with Cy5-dUTP or Cy3-dUTP (Amersham) using oligo-(dT)-primed reverse transcriptase (Superscript II, Life Technologies) and hybridized to PCR products immobilized on glass slides. Fluorescent images were acquired using a custom-designed confocal scanner equipped for dual laser excitation at the appropriate wavelengths. Pseudo-colored images were obtained by placing one fluorescent image into the green channel and the other into the red channel. A detection method was then employed to determine the actual target region based on the information from both red and green pixel values . The ratios of the red intensity to the green intensity (R/G) for all targets were determined and normalized with 88 preselected internal control genes. The hybridization quality of each target area was based on fluorescence intensity background and signal to noise ratio, as described in detail at http://www.nhgri.nih.gov/DIR/Microarray/main.html. MDA-MB-436 cells were transfected with an expression vector containing the full-length human AIB1 cDNA and cultured in the presence of neomycin for the selection of stable transfectants. While numerous resistant colonies were selected for expansion, the majority gradually died following culture passage. The viable colonies were expanded and characterized. Additionally, five independently transfected populations were selected en masse and expanded for characterization. To determine if the transfected cells expressed the exogenous AIB1 cDNA, RNAs from viable clonal populations were analyzed by Northern blot. One of the clones, designated 436.1, showed significant expression of the predicted 5.7 kb transcript (Fig. 1A). This transcript was not detected in other transfected clones (e.g., 436.5) or in five en masse selected populations (data not shown), suggesting the exogenous AIB1 cDNA was not highly expressed in these cell populations. Next, Western blot analysis of whole cell lysates from the parental MDA-MB-436 and the 436.1 cells was performed to ascertain if 436.1 cells displayed increased AIB1 protein. Figure 1B shows high levels of AIB1 protein in the 436.1 cells compared to the parental cells. Taken together, these results illustrate that the 436.1 cells integrated and significantly expressed the transfected AIB1 cDNA. Analysis of coactivator RNA and protein levels in BT474 and wild-type and AIB1-transfected MDA-MB-436 cells. (A) RNAs from AIB1 transfected 436.1 and 436.5 cells, and breast cancer cell lines, BT474 and MDA-MB-436, were analyzed by Northern blot. All cell lines expressed a full-length endogenous AIB1 transcript of 9.0 kb, whereas a transcript of 5.7 kb derived from the exogenous AIB1 cDNA was detected in an AIB1 transfectant (436.1). The corresponding ethidium bromide-stained gel indicates equivalent loading. (B) Whole cell lysates from wild-type MDA-MB-436 and from AIB1-transfected 436.1 cells were analyzed by Western blot. The 160 kDa AIB1 protein was detected in both cell lines, with increased amounts seen in AIB1-transfected 436.1 cells. Tubulin is included as a loading control. (C) The membrane used in A was stripped and hybridized with probes for SRC-1 or TIF2 cDNAs. (D) The membrane used in B was stripped and probed with anti-CBP and anti-p300 antibodies. Previous reports have demonstrated compensatory effects of p160 coactivator expression levels with the loss of one of the p160 coactivators [15, 16]. In SRC-1 knockout mice, for example, the expression of TIF2 is increased in certain tissues. To examine if the increase in AIB1 mRNA expression in 436.1 cells was paralleled by changes in SRC-1 or TIF2 coactivator levels, the Northern blot was stripped and hybridized with cDNAs of SRC-1 and TIF2. Densitometric measurements indicated approximately 10% and 15% reduction in the expression levels of SRC-1 and TIF2, respectively, in the 436.1 cells compared to the MDA-MB-436 parental cells or the AIB1 transfected cell line, 436.5, which failed to express the 5.7 kb transcript (Fig. 1C). To determine if the levels of the general co-integrator proteins, CBP or p300, had changed in the 436.1 cells, the Western blot from Figure 1B was stripped and probed with either anti-CBP or anti-p300 antibodies. Interestingly, a significant increase in the levels of CBP protein was observed in the 436.1 cells compared to the parental cells, whereas levels of p300 appeared slightly reduced (Fig. 1D). The 436.1 cells are morphologically distinct from the parental MDA-MB-436 cells. While the MDA-MB-436 cells display a typical epithelial morphology, the most conspicuous feature of the 436.1 population was the appearance of giant cells with abundant cytoplasm, often exhibiting multiple nuclei or a multilobular nucleus (Fig. 2). 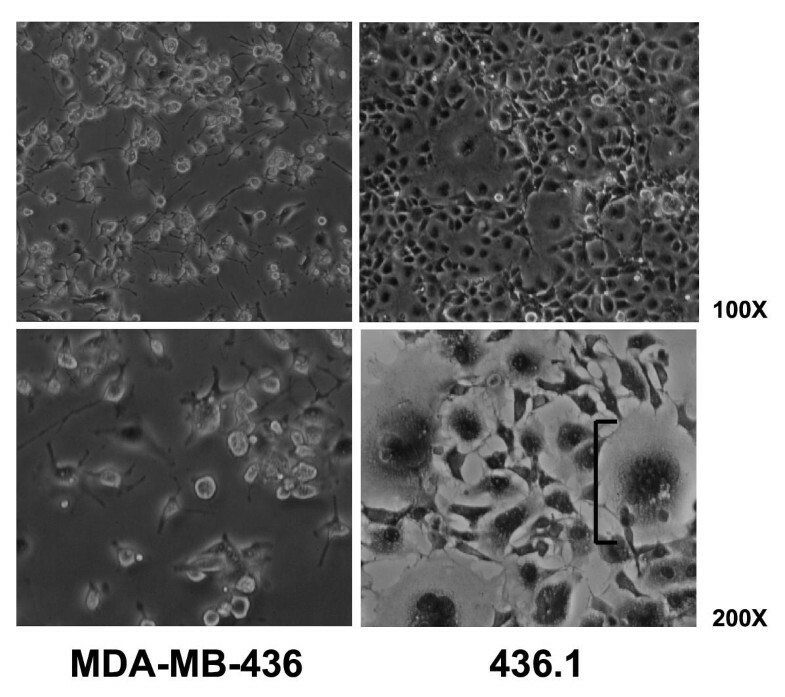 Comparison of the cellular characteristics of MDA-MB-436 and the transfected, 436.1 cells. MDA-MB-436 and 436.1 cell morphology was examined using a Nikon microscope equipped with 10× and 20× objectives. Images were captured using a 35 mm Nikon camera. Note the large, cells with multilobular nuclei in the 436.1 culture (bracket). The cellular distribution of AIB1 protein in MDA-MB-436 and 436.1 cells was examined by immunofluorescence (Fig. 3). AIB1 staining of MDA-MB-436 cells produced a diffuse nuclear and faint cytoplasmic pattern (Fig. 3A). In addition to the nuclear staining, bright speckles were localized to the nucleoli in some cells. AIB1 distribution in the majority of 436.1 cells was similar to that observed in the parental MDA-MB-436 line, but the staining appeared brighter and more granular (Fig. 3B). The brighter speckles localized in the nucleoli were also apparent and often arranged at the nucleolar periphery. Immunofluorescence of AIB1 and CBP in MDA-MB-436 (top row) and 436.1 (bracket) cells. Primary antibodies are as indicated. The cells were fixed at approximately 70% confluency and counterstained with DAPI (first panel). Red corresponds to AIB1 staining revealed with the Cy3-conjugated secondary goat anti-mouse antibody (second panel) and green corresponds to CBP staining with fluorescein isothiocyanate-conjugated goat anti-rabbit secondary antibody (third panel). The DAPI, AIB1, and CBP images from the same field of cells are merged in the last panel. The majority (~99%) of 436.1 cells showed bright diffuse nuclear and cytoplasmic AIB1 staining, yet additional staining patterns of AIB1 were also seen in 436.1 cells that were not apparent in the parental MDA-MB-436 cells. Some of the cells displayed bright, dot-like nuclear AIB1 staining (Fig. 3C) or had reduced nuclear signal with profound cytoplasmic staining (Fig. 3D) that appeared to be concentrated in cytoplasmic organelles. Since Western blot analysis revealed increased levels of CBP protein in the 436.1 cells, an anti-CBP antibody was used for immunofluorescent detection of endogenous CBP in each of the cell lines. Interestingly, CBP staining was faint and homogeneously diffuse throughout the nucleus in the MDA-MB-436 cells (Fig. 3A); while in the 436.1 cells, three or more bright, dot-like foci appeared in the nucleus, in addition to the diffuse nuclear staining (Fig. 3B,3C,3D). These results suggest upregulation of CBP leads to altered protein distribution within the cells. A clear correlation between the number of CBP dots and the different AIB1 staining patterns could not be established, though in a few cells some CBP dots co-localized with AIB1 dots (data not shown). The results described above demonstrate that the 436.1 cells have integrated andexpressed exogenous AIB1, with small reductions in the expression of TIF2 and SRC-1, and a large increase in CBP levels. The effects of these alterations on estrogen receptor-α dependent transactivation in 436.1 cells were examined in transient transfection assays using an ER reporter and varying concentrations of an estrogen receptor-α expression plasmid. An estrogen-induced response was seen in both cell lines, but the 436.1 cellsdisplayed a dramatic increase (approximately 20-fold) in the overall luciferase reporter gene activity compared with the parental line (Fig. 4). The increase in luciferase activity in 436.1 cells was observed in both the absence and presence of added ligand. Moreover, an increase in reporter activity was also observed with increasing amounts of transfected receptor (50 ng to 500 ng). These results suggest increased expression of AIB1 and CBP augments the capacity of 436.1 cells to assemble functional ER/ERE coregulator complexes. AIB1 transfected 436.1 cells display increased reporter gene activity. Cells weretransiently transfected with increasing amounts of estrogen receptor expression plasmidand 1.5 ug of pGL3. ERE. luc reporter vector and incubated in the presence or absence of ethanol (EtOH), 10 nM 17β-estradiol (E2), or 100 nM 4-hydroxytamoxifen (Tam). Results are representative of three experiments. Relative luciferase activity = Luciferase/Renilla. The dose-response curve for a particular steroid predicts the biological response of the exposed cell to a given concentration of ligand. Since the levels of transactivation were profoundly higher in 436.1 cells compared to MDA-MB-436 cells, we asked if the estrogen dose-response curve was modified in the 436.1 line compared to MDA-MB-436 cells. For these studies, different concentrations of ER were used to ascertain that the receptor was limiting and that increased response is obtained over a range of steroidconcentrations. 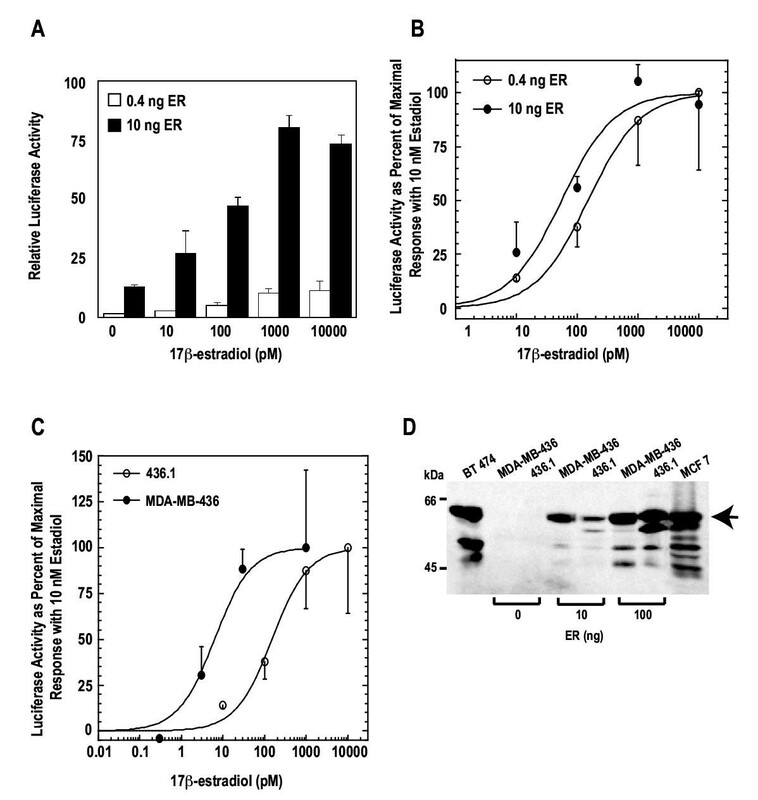 Thus, transient transfections were performed in which 0.4 ng and 10 ng of ER-α plasmid were transfected into MDA-MB-436 and 436.1 cells and incubated with increasing concentrations of 17β-estradiol. In 436.1 cells, increasing amounts of ER-α from 0.4 ng to 10 ng increased reporter gene expression at each concentration of steroid (Fig. 5A). To determine if the dose-response curve of estradiol has been altered by the addition of ER-α, the data from Figure 5A is replotted as a percent of the maximal activity induced by a saturating concentration of 17β-estradiol (Fig. 5B). Significantly, concentrations. The the dose-response curve is shifted to a lower EC50 with higher ER-α average left shift in the dose-response curve was 2.2 ± 0.33 fold (SEM, n = 8, P = 0.0085) with increasing ER-α plasmid. This effect was also seen in the MDA-MB-436 cells, but total gene expression reached maximal activity at a much lower ligand concentration. Figure 5C illustrates the dose-response curves of both MDA-MB-436 and 436.1 cellstransfected with 0.4 ng ER-α. The EC50 of 13 ± 4 pM (SEM, n = 5) in MDA-MB-436cells was significantly right shifted in 436.1 cells to 118 ± 20 pM (SEM, n = 8, P = 0.0016 by Mann-Whitney test) 17β-estradiol. Dose-dependent stimulation of luciferase activity by 17β-estradiol. MDA-MB-436 and 436.1 cells were transiently transfected with 0.4 or 10 ng of estrogen receptor plasmid (pHEGO-hyg) and incubated in the presence of ethanol or increasing amounts of 17β-estradiol. The total levels of luciferase seen with ethanol and varying levels 17β-estradiol in 436.1 cells are plotted in (A). The data from (A) was replotted in (B) as a percentage of the maximal activity with 10 nM 17β-estradiol, as described in the Materials and Methods section. To facilitate direct comparison of the position of the dose-response curves for the two cell lines, the data from (A) and that obtained with MDA-MB-436 cells with 0.4 ng ER (data not shown) is illustrated in panel (C). The data are representative of eight (436.1) and five (MDA-MB-436) experiments. 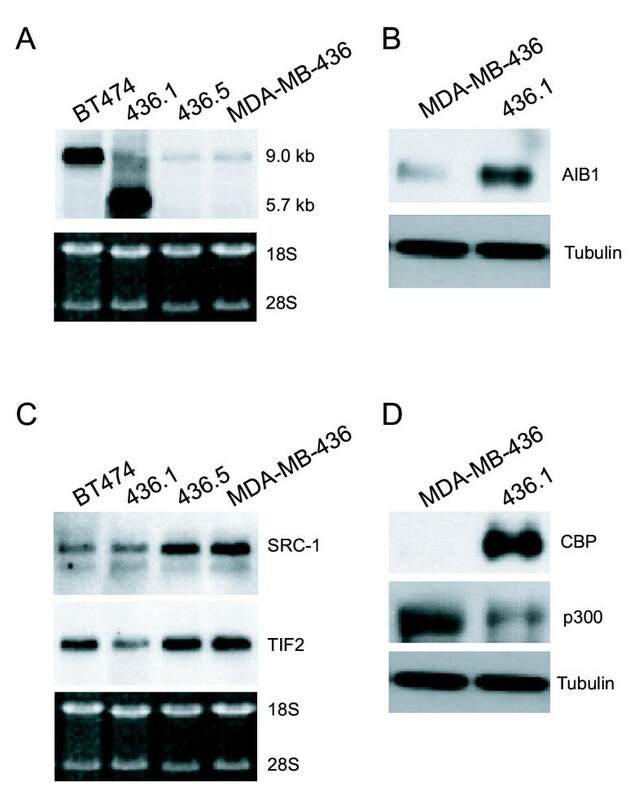 (D) Whole cell lysates from ER-positive BT474 and MCF-7 breast cancer cells and transiently transfected MDA-MB-436 and 436.1 cells were analyzed by Western blot. The 58 kDa ER protein (arrow) was detected in ER-positive BT474 and MCF-7 cells, as well as both cell lines that were transfected with 10 and 100 ng of ER. Next, we determined if the increased levels of AIB1 and CBP coactivators in 436.1 cells modified the levels of transfected ER-α. Cellular lysates from MDA-MB-436 and 436.1 cells transfected with 10 ng and 100 ng of ER-α were analyzed by Western blot. The levels of full length ER-α protein were not significantly increased in the 436.1 cells relative to the parental cells, indicating the observed increase in ER-dependenttransactivation in these cells is not the result of increased receptor levels (Fig. 5D). Finally, cDNA microarray analysis was performed to examine endogenous gene expression  in the 436.1 cells compared to MDA-MB-436, and to identify potential downstream effects of AIB1 overexpression. Total RNAs from MDA-MB-436 and 436.1 cells were reverse-transcribed and labeled with fluorescent Cy3 and Cy5 dyes. Replicate experiments were also performed in which the fluorescent labels were reversed. Labeled RNAs were hybridized to a cDNA microarray containing 7,088 cDNAs arrayed on a glass slide. Out of 3,658 genes which met hybridization quality criteria (see methods), a total of 94 and 87 genes were upregulated and downregulated, respectively, by a factor of 3 or more in 436.1 cells compared to MDA-MB-436 cells. The 30 most significant outliers in each category are listed in Table 1 [see additional file 1]. Vast epidemiological data supports a causative role for estrogens in the development of human breast cancer. Though significant progress has been made in the identification and characterization of a large number of proteins that participate in estrogen signaling, the precise molecular mechanisms that control specific cellular responses to endogenous and exogenous ligands of the ER signaling pathway are complex and not completely understood. However, increased understanding of hormone action suggests that the cell type and/or co-regulator levels dictate the ultimate response to ligand. The present study was initiated to examine the cellular and molecular consequences of AIB1 overexpression. Our previous report demonstrated that the majority of ER-positive breast cancer cell lines have correspondingly high levels of endogenous AIB1 expression (four out of five cell lines analyzed); therefore, the number of suitable cell lines in which to generate stable overexpression of AIB1 are limiting . Of interest, transfection of the AIB1 cDNA into the ER-positive, low AIB1-expressing cell line, T47-D, demonstrated a cell-lethal phenotype and no subclones with high levels of AIB1 expression were generated (data not shown). 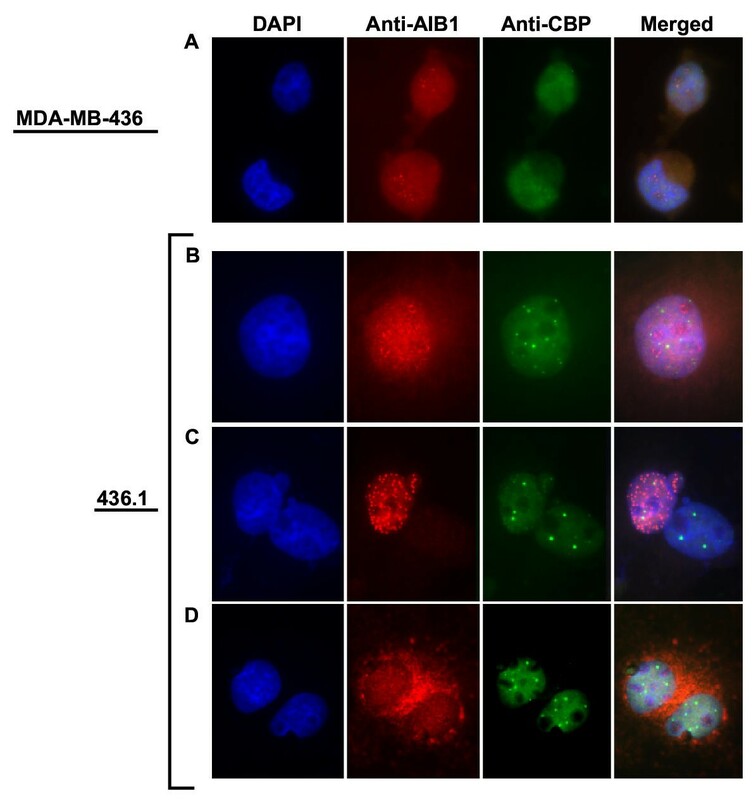 Likewise, transfection of AIB1 into MDA-MB-436 breast cancer cells appears to be lethal since all but one of the surviving subclones failed to demonstrate expression of the transfected AIB1. The 436.1 line discussed in this study, however, has integrated the exogenous AIB1 cDNA and maintained high levels of AIB1 mRNA and protein expression. Most likely, 436.1 cells have acquired additional alterations which support its survival. 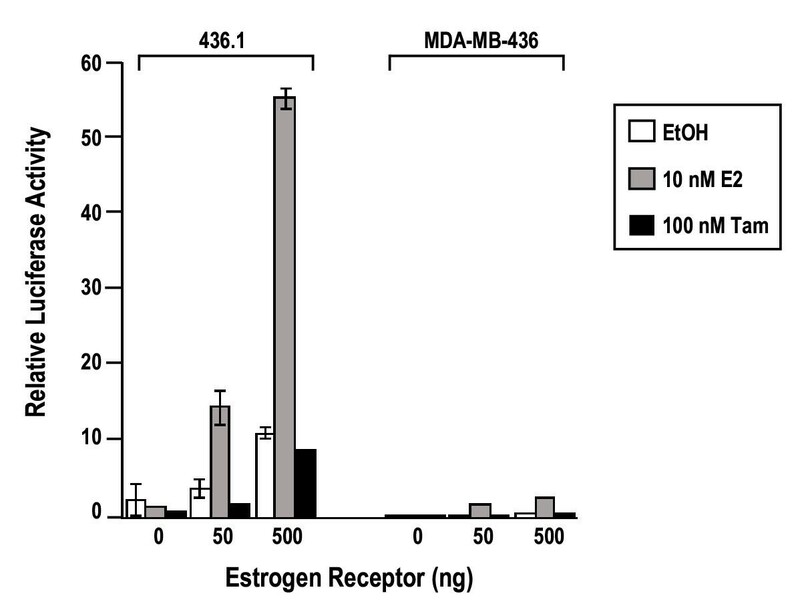 Though the parental MDA-MB-436 cells are ER-α negative, transient transfection of ERα was capable of inducing expression of an ERE-regulated reporter gene in the presence of estrogen, indicating these cells contain sufficient amounts of co-regulatory factors required for estrogen inducibility. Furthermore, since the levels of ER-α could be experimentally modulated in transient tranfection studies, this derivative cell line provided a useful model to compare the effects of low-level, constitutive versus high-level expression of AIB1 in the presence or absence of varying concentrations of ER-α. Immunostaining patterns of AIB1 and CBP included diffuse fluorescent staining as well as large, bright, dot-like foci (Fig. 3). Although the punctate-staining pattern of AIB1 in 436.1 cells resembled CBP containing PML (promyelocytic leukemia protein) oncogenic domain (POD)-like structures [17, 18], the AIB1 dots appeared in only a small percentage of the population (< 2%) and typically did not overlap with CBP. Analyses of populations derived from single cell isolates revealed that the punctate staining was not a clonal variant. Similarly, Baumann et al used GFP-fused to GRIP1 to investigate its intracellular distribution in HeLa cells and observed both diffuse and focal accumulation of GRIP1 . CBP staining, on the other hand, was consistently diffuse throughout the nucleus in MDA-MB-436 cells but appeared to accumulate in PML-like bodies in the AIB1-transfected 436.1 cells. These results are consistent with observations made recently by Boisvert et al ; several cell lines do not accumulate CBP into PML bodies, but transfection of a GFP-CBP fusion protein into these cells leads to accumulation of CBP into distinct PML nuclear bodies. Taken together, these observations imply that increased amounts of AIB1 and CBP have caused the redistribution of these proteins into nuclear foci in 436.1 cells. Perhaps the levels of CBP and AIB1 are below the level required for recruitment to nuclear bodies in the non-transfected MDA-MB-436 cells. 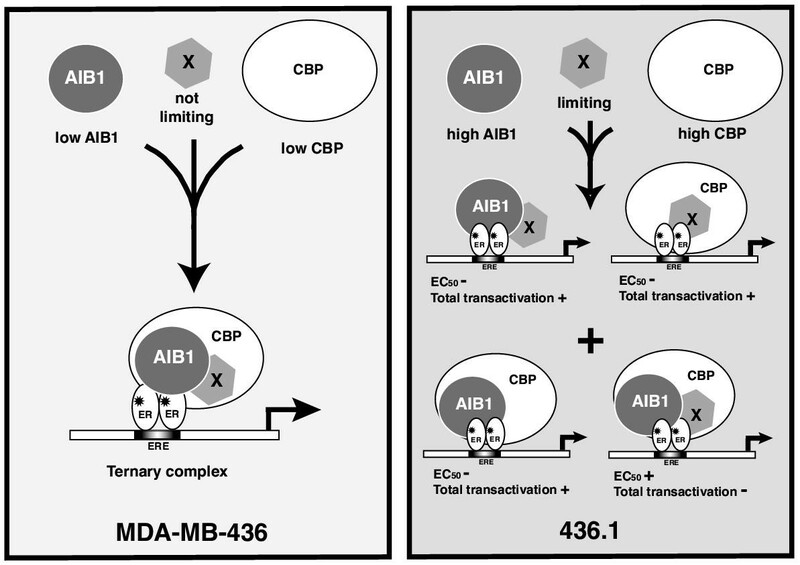 The mechanisms for upregulation of CBP in 436.1 cells remain elusive, but it will be interesting to determine if overexpression of AIB1 plays a direct role in the transcriptional regulation of CBP, or if levels of CBP are sensitized to and somehow adjusted with levels of AIB1, or vise versa. While the overall level of reporter gene activity was dramatically increased in 436.1 cells, perhaps the most striking observation is in the right in the shift of the estrogen dose-response curve in 436.1 cells. The repositioning of the E2 dose-response curve to the right in 436.1 cells was somewhat unexpected since several studies with other receptors have demonstrated a left shift in the dose-response curve with the addition of p160 proteins, including TIF2 and SRC-1 [21–24]. However, there is no evidence that the total levels of transactivation and the position of the dose-response curve are linked. Studies with glucocorticoid [21, 25–28] and progesterone [22, 28] receptors show that the two phenomena can be totally disconnected. Increased total transactivation might be expected if the concentrations of two coactivators (AIB1 and CBP) are increased, but this does not predict the effects of these changes on the dose-response curve and EC50. One explanation for these observations is squelching, where increased levels of AIB1 compete for some limiting factor that is crucial for nuclear receptor transactivation, such as CBP. Because we have also demonstrated that the levels of CBP are significantly elevated in the 436.1 cells it is unlikely that the level of CBP is limiting. However, AIB1 and CBP could be competing for a common factor that is now limiting due to AIB1 and CBP abundance . Also, cell specific differences, which have caused some coactivators and corepressors to be apparently inactive [21, 22] or to have opposite activities [22, 28], may be important. We propose a hypothetical model to explain the increase in total transactivation and the overall right-shift in the dose-response curve, as schematized in Figure 6. In this model, the dose-response curve depends on the presence of a ternary complex composed of AIB1, CBP, and a third, unknown nuclear receptor complex participant, depicted as X. In MDA-MB-436 cells, the levels of AIB1, CBP, and factor X, are at concentrations sufficient to form ternary AIB1/CBP/X complexes that support the observed dose-response curve. The absence or dramatic reduction of such a ternary AIB1/CBP/X complex in 436.1 cells (due to increased levels of AIB1 and CBP and limiting levels of X) might result in a very different EC50. In fact, by the law of mass action, elevated levels of AIB1 and CBP would be expected to cause increased levels of the dimeric complexes (i.e., AIB1/X, AIB1/CBP, and CBP/X). Each of these may cause increased transactivation but not permit the same positioning of the dose-response curve as in MDA-MB-436 cells, resulting in a relative increase in the EC50 and a right shift in the dose-response curve. The greatly decreased levels in 436.1 cells of the ternary AIB1/CBP/X complex, which has no effect on the level of total transactivation, would now have only minimal effects of the positioning of the dose-response curve. A proposed model of how increased concentrations of AIB1 and CBP in 436.1 cells compete for a factor that is necessary for estrogen-induced transcription. As schematized on the left, transcriptional activation through the estrogen receptor relies on interaction with AIB1, CBP, and an unknown factor X. In MDA-MB-436 cells, none of these components are limiting. The 436.1 cells have limited amounts of factor X and excess quantities of AIB1 and CBP, which compete for binding to factor X. The absence or presence of a ternary complex of AIB1/CBP/X in 436.1 cells affects the EC50 and transactivation, as schematized. Additional support for this model comes from several lines of evidence. First, convincing evidence for a limiting factor other than p160 coactivators has been demonstrated by Lopez et al. . These investigators have shown that squelching between different receptors cannot be relieved by supplying excess amounts of CBP or p160 coactivator and suggest there is an unknown factor that is necessary for receptor coactivation. Similarly, Kino et al reported that the amount of CBP that is required to see a decrease in glucocorticoid receptor (GR) transactivation is cell dependent . The presence of a limiting complex component that participates in the positioning of the dose-response curve has been established by Chen et al . Here, the effects of modulators (GR, TIF2, or a cis-acting element in the reporter gene) were additive when all components were limiting, but no further effect was obtained if saturating amounts of any one modulator was present. Second, there is a well established physical interaction between CBP/p300 and p160 coactivators [13, 30–32], and several groups have proposed that CBP and other coregulators, e.g., p160s, exist in the cytoplasm in preformed complexes [33, 34]. Candidate genes whose altered expression might contribute to the phenotypic features of the 436.1 cells, such as cell survival, multinucleated morphology, and transcriptional properties were identified by cDNA microarray technology. Comparison of RNAs from MDA-MB-436 versus 436.1 revealed a number of profound changes in the expression of genes with a variety of functions, including cell adhesion, communication, maintenance of cell shape, apoptosis, and cell cycle control. For example, cyclin D3, an important regulator of endomitosis and polyploidization in megakaryocytes , was upregulated 3.75-fold in 436.1 cells, suggesting upregulation of cyclin D3 contributed to the altered morphological features observed in these cells. An 8.2-fold upregulation of the apoptosisinhibitor 2 gene may have facilitated the survival of these cells. Downregulation of NFkB and C/EBPβ cDNAs (ratios of 0.3 and 0.5, respectively) and a number of interleukins whose gene expression are regulated by these transcription factors (Table 1) possibly indicates a shift away from NFkB and C/EBPβ signaling to transcriptional activities mediated by other transcription factors. Finally, none of the general transcription factors, including TFIIA (ratio = 1.1), TFIIB (ratio = 1.0), TFIID (ratio=.53), TFIIE (ratio = 1.25), TFIIF polypeptides 1 and 2 (ratio = 0.63, 0.94), and TFIIH (ratio = 1.16) showed increased expression in 436.1 cells, supporting the idea that AIB1 and CBP overexpression play a significant role in the observed increase in basal and E2-induced reporter gene activity in 436.1 cells. Future studies are necessary to confirm these observations and to determine which are genes regulated by transcriptional complexes containing AIB1. In summary, we have characterized an AIB1-transfected cell line that displays high levels of AIB1 expression. The data presented here support a role for AIB1 in the estrogen-dose response and also suggest that, apart from ER-mediated pathways, AIB1 contributes to a number of signaling events which influence cell cycle, morphology, and survival. Future efforts directed at determining how overexpression of AIB1 affects cell behavior in the presence or absence of specific hormone receptors should shed light onto specific signaling pathways that are altered as a consequence of AIB1 amplification in breast cancer. This work was done in partial fulfillment of the Ph.D. requirements of the Molecular and Cellular Oncology Program for S. L. Anzick. The authors wish to thank J. Lueders, B. Walker, K. Gayton, and H. Cunliffe for technical assistance and helpful discussions.